Lilian Bomberg, the artist's wife. European Private Collection; Sotheby's, Tel Aviv, 26 October 2000, lot 30, where purchased by the present owners. Exhibition catalogue, David Bomberg in Palestine: 1923-1927, Jerusalem, The Israel Museum, 1983, p. 45, no. 25, illustrated. R. Cork, David Bomberg, London, 1987, pp. 166-7, no. 218, illustrated. Exhibition catalogue, David Bomberg, London, Tate Gallery, 1988, p. 155, no. 89, illustrated. London, Tate Gallery, David Bomberg, February - May 1988, no. 89. Newcastle, Arts Council, Laing Art Gallery, David Bomberg 1890-1957: An exhibition of Paintings and Drawings, May - June 1958, no. 67: this exhibition travelled to Swansea, Glynn Vivian Art Gallery, June - July 1958; Middlesbrough, Art Gallery, July - August 1958; Kettering, Art Gallery, August - September 1958; London, Arts Council Gallery, September - October 1958; and Bradford, Cartwright Memorial Hall, October - November 1958. Jerusalem, The Israel Museum, David Bomberg in Palestine: 1923-1927, Autumn 1983, no. 25. 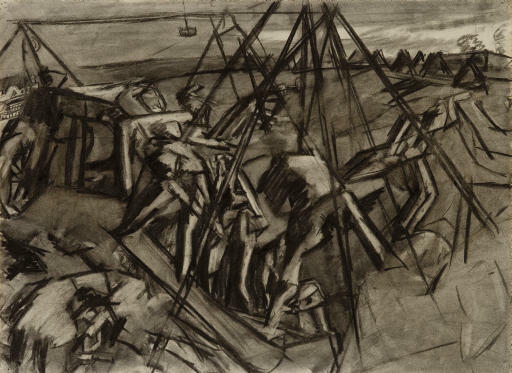 To fulfil his commitment to the Zionist Organization to produce a number of works that they could use for propaganda purposes Bomberg executed a group of works that depict workers in the stone quarries. Stephanie Rachum writes, 'There were several such quarries in the Jerusalem area, producing stone for the budding building industry ... a number of drawings also exist. In Quarrying: Jewish Pioneer Labour [the present work] the energetic workers strain over an incision they have made in the hard rock. The triangular shapes of the overhead supports, bent bodies, and tents in the distance, set up a rhythmic repetition of form throughout. This drawing is the closest Bomberg came to a heroic depiction of pioneer labour' (see Exhibition catalogue, David Bomberg in Palestine 1923-1927, Jerusalem, The Israel Museum, 1983, pp. 29-30).